The author retains all rights. No reproductions are allowed without the author's consent. MP 54.52 - Rutland Amtrak station. Chris and I arrived at the station 9:00AM. and a little early for our scheduled 10:00AM departure for New York State. 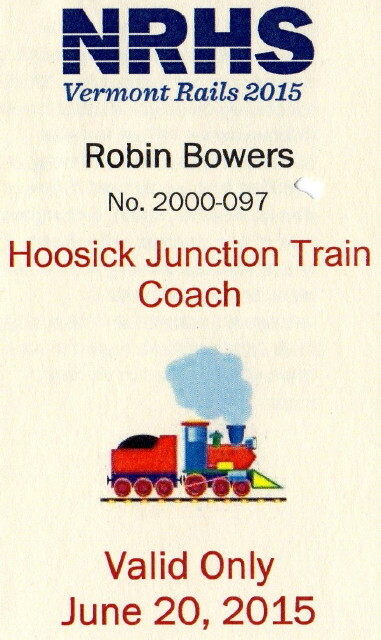 Hoosick Junction is just a few miles west of the Vermont state line. Setting on the siding was the Ethan Allen Express. Normally this train leaves at 8:00AM, Monday thru Friday, 11:00AM on Saturday, Sundays at 5:05PM so it was not unusual to see it here for its 11AM departure. As we were waiting for our train to arrive, the story going around the group was that last night the Ethan Allen Express derailed. On Friday they have a late arrival at 11:13 from Penn Station and then they wye the train to be ready for tomorrow's run. When the conductor threw the switch he didn't lock it securely, therefore the switch worked back and as the last car crossed over, it caused the wheels to go into the ground. Apparently the crew was able to put the car back on the rail and they were are now waiting for mechanics to arrive and inspect the train to determine if it could be put back in service. Our train arrived at the station and we boarded for our last convention train trip. Today I was riding in Coach-Combine Car #280 and the power was our friends Locos #301 and #311. We departed on time at 10:00AM. Vermont Rail System runs a tight, good, on time railroad. Today's consist is Loco 301 and Loco 311, #4 Macintyre, Dover Harbor, 280 -Combine, 1306 -Coach, 1317 -Coach, 1319 -Coach, 1313 -Table Car, 3089 -Table Car, 3091 -Bar/Lounge, S&NC Dome 512 -Tanana, 9105 -HEP Car. MP 54.22 B&R Junction - This is the junction between the two lines that depart southward from Rutland. To the southeast is the line to Bellows Falls and to the south is the line to Bennington (B&R Subdivision). To the north is the Northern Subdivision to Burlington. MP 54.0 Rutland Wye - To the west is a wye track used to turn Amtrak's Ethan Allen Express train. MP 45.07 Wallingford - Wallingford dates back to a November 27, 1761, grant by Governor Wentworth of New Hampshire. The Village of Wallingford did have one interesting industry develop - pitchforks. See more of Wallingford in my story in Chapter Six. Chick here to go to Chapter Six. Click back button on your browser to return to this page. MP 40.2 Stafford Pit - There were two sidings and at least one long spur track to the east. The distance between the north and south switches was 3500 feet. According to some sources, the Stafford pit was purchased July 9, 1927, and a manual block station was established on June 6, 1928, to protect gravel trains in and out of the pit. In later years the Rutland Railroad used the pit to burn old wooden cars for the metal scrap and to get rid of the car. This stop is to be the venue for our photo runby and we were told the railroad had made a big push to clean up the area before we arrived. Watch my video at : Click here to watch video. Click Back button on your browser to return to this page. MP 31.5 Emerald Lake, to the west and originally known as Dorset Pond, is today part of Emerald Lake State Park. The park began when Robert Alfred Shaw purchased more than 1,000 acres of land between 1918 and 1921, establishing North Dorset Farms. Following Shaw's death in 1957, the State purchased approximately 1,000 acres from his estate. The name Emerald Lake came from the emerald green color of its waters. Today, the state park is known for its wooded hillside campground, beach and swimming area, and nearby trails. MP 23.16 Manchester - Today, the original Rutland Railroad freight station is now part of Miles Lumber, a company that in the past logged, milled and sold timber throughout the area. Manchester, the north shire town of Bennington County, was a fairly significant railroad junction town during the 1910's At that time, smaller railroads headed east and west to haul out natural resources: timber and marble. The Town of Manchester was chartered in 1761 by Benning Wentworth, colonial governor of New Hampshire. Wentworth had a custom of naming new town after prominent English aristocrats of the day, hoping they might a patronly interest in their namesakes. Wentworth named Manchester for Robert Montagu, 3rd Duke of Manchester. Read more in Chapter Six. The train station in North Bennington is a significant railroad structure. Built in 1880 at the Main Street grade crossing and known as the office call of "NR". This location placed it just west of the switch for the wye to Bennington. Described architecturally as Empire style, the station is currently used by several local government agencies. The building was entered in the National Register on April 11, 1973. Car #3089 was built by Budd for the ATSF in February, 1937. It has been rebuilt into a 52-seat table car with a bar area on one end. Today's power #301 & #311. We are now watching a magic show with a disappearing act. In background, tracks still used by Whitman's Feed Store and their elevator complex. Our train continues getting smaller and smaller. Our train is so tiny and far away. Now our train reappears sans locos 301 and 311. The business car Macintyre featuring an open platform will now be the end of the train. But it will be on point for our trip to Hoosick Junction as we will be pushed over the state line. What a view for those on the open platform going to Hoosick Junction. Looking toward locos end of train. MP H2.2 Walloomsac - The word walloomsac is reportedly a Dutch term (wallumschaik) meaning Wallum's patent. The Walloomsac patent was to the north of the larger Hoosick patent, and was made on June 15, 1739. Among those involved with the patent were Gerardus Stuyvesant and Stephen Van Rensselaer. This mill dates back to 1854 when the mill made cloth from cotton. Sometime over the years, the plant was changed to make paper. A marble plaque on one of the buildings states that the mill was rebuilt in 1874, 1881, 1900 and 1914. After passing through numerous hands, the Windsor Paper Company bought the mill in 1941 and operated it until 1943. One of their products was a paper for wrapping meat and a dish material for meat products. Thomas A. Galante and Sons operated the mill from 1943 to 1953 and continued producing the same types of products. Columbia Boxboard acquired the mill and operated it from 1953 to 1990. The mill kept the Columbia Box name when it was sold in 1990 to York Town Company. In 1995, it was sold again, this time to Bennington Paperboard Company and ceased manufacturing operations in August 2008, and the facility is now known as Walloomsac Recycling. According to the August 22, 2012, issue of The Record newspaper of Troy, New York, the Hoosick Planning Board approved a proposal to convert the mill into a vehicle dismantling facility known as Walloomsac Metal Recycling. The facility includes over 80,000 square feet of indoor storage and a truck scale. Steel recycling and automobile crushing at also available on-site. Looking toward the Macintyre car. Looking toward dome car and the locos end of the train. GPS 42 55.396 -73 21.647. Click to see map. Click back button on your browser to return to this page. Once our forward motion stopped, we were at the end of the line. There was a small pause before we started our return to the state line and then North Bennington. The mile markers numbers will increase until we reach Rutland. MP H1.1 North Hoosick - What is today known as North Hoosick started as St. Croix, an early French settlement. Reportedly, the community was abandoned and replaced by a English community, which was also abandoned after being attacked by a party of French and Indians on August 28, 1754. North Hoosick, NY Post Office. on Rte. 22 near junction with Rte 67. MP H5.0 = 0.0 Mileage Conversion. White Creek Station - White Creek is at the state line between Vermont and New York, and the dividing line between the original Troy & Bennington Railroad and the Western Vermont Railroad. On paper, White Creek was the interchange point between the Rutland and later the Vermont Railway, and the Boston & Maine. However, the actual interchange was done in North Bennington where a small yard, wye and agent made the task easier. As stated, White Creek is a border town, with most of the community scattered over several miles to the north. The highway grade crossing is a good example as the road is called State Line Road. To the south (railroad-east) is State Line House, listed on the National Register of Historic Places. The border goes through the middle of the structure. When built in 1794, the house faced the stagecoach road to the north, and what eventually became the railroad tracks. Later, the construction of a new road and the electric interurban route to the south encouraged the owners to make the back the front of the house. Later, the owners turned part of the building into a bar, allowing them to serve drinks in the state with the most favorable laws at the time. The tracks in New York are in Rensselaer County. Kiliaen van Rensselaer, a Dutch jeweler and merchant, purchased the area in 1630 and created Rensselaerswyck. At the time, the land was part of the Dutch colony of New Netherland. In 1664, the land became English, but the Dutch regained control in 1673. The land reverted back to the English the next year and then became part o the United States in 1776. Rensselaer County was created in 1791 when land was taken from Albany County. In Vermont, the county is Bennington County, Bennington County was created on March 17,1778, and is the oldest county in Vermont still in existence. Over the years, several counties were created out of Bennington, including Rutland Country and part of Windham County. Bennington County had two county seats, known in Vermont as shire towns. These are Bennington (the Southshire) and Manchester (the Northshire). MP 1.96 North Bennington 1.96 miles from state line. Our train arriving again in North Bennington crossing Main St.
To the east of the station is the former Rutland freight house, located to the south (railroad east) of the mainline in the center of the wye. Mileage marker "NR 1.96" to the left of building. MP 28.33 East Dorset - An 1869 Bennington County Beers Atlas map for East Dorset shows a village that boasted a hotel, two stores, two churches, a school, a railroad, a cheese factory, a lumbering operation, a wooden ware manufacturer, at least eight marble mills or finishing shops and many houses. Although the industries are gone, almost all of the houses remain. One of the most significant of these is the Wilson House, originally the Mt. Aeolus Inn, located across the highway to the east. This inn, built in 1852, was the birthplace of William Griffith Wilson, also known as Bill Wilson or Bill W, co-founder of Alcoholics Anonymous. Interestingly enough, Bill was born in a room behind the bar operated by his parents. He is buried nearby. Chick for Wilson House. Click back button on your browser to return to this page. Otter Creek forms on the western slopes of Mt. Tabor (el. 3043) and flows southwesterly into the town of Dorset towards East Dorset. From there, it flows northward into Emerald Lake. Otter Creek continues flowing north through the City of Rutland and then Proctor. It eventually empties into Lake Champlain at Ferrisburgh. Otter Creek is the longest river in Vermont at more 110 miles, and Rutland Railroad predecessors used its route for much of their construction. The name Otter Creek comes from its original French name 'La Riviere aux Loutres" which means river of otters. MP 54.52 Rutland - Amtrak station. Our arrival of the last train of the convention was at 7:40PM. The 2015 NRHS Convention was a big success, a great week and we were able to explore a lot of the GREEN Mountain State. At the station Chris and I said farewell to our fellow conventioneers wishing them God speed on their return trip home and a promise to meet again next year in Denver, Colorado. After leaving the station, we made a dinner stop at KFC and returned to our home for the past week. Tonight we have to pack up and be ready to leave in the morning for a new state, New Hampshire. From there we'll visit Maine, then Massachusetts, Connecticut and then back to Vermont for one last visit on 6/28 at Brattleboro. A different motel every night. Like being on road with a band. After leaving New England, Chris and I will ride Amtrak to Norfolk for a several days before going to Washington DC. I will take the Crescent to New Orleans, spend 4th of July there and visit with my cousin. From New Orleans I will take the Sunset Limited home to California with a quick visit with another cousin in Tuscon. From DC Chris will travel to Chicago on the Cardinal and then on the Southwest Chief to home in Southern California. What great adventures to look forward to.